Purpose: To determine ocular side effects of vardenafil with special regard to color vision and retinal function. Methods: This was a single center, randomized, double-blind, placebo-controlled, twofold crossover study with an administration of a single oral dose of two 20 mg tablets of BAY 38–9456 (vardenafil hydrochloride) or corresponding placebo in 24 healthy male subjects. Ocular investigations included Farnsworth–Munsell D100 color vision test, electroretinogram, and basic ophthalmological examinations like visual acuity, visual field, and slit-lamp of anterior segment and fundus. Results: Compared to placebo, administration of vardenafil hydrochloride lead to a temporary significant increase of Farnsworth–Munsell D100 total error score after 1 and 6 hours as well as in error lines 3 and 4 after 1 hour. Twenty-four hours after administration there was no significant alteration of total error score or of any error line. While latency of electroretinogram b-wave remained unaffected, amplitudes showed a significant decrease compared to placebo 1 hour following administration. While other ocular examinations did not reveal any differences in general some mild to moderate but no serious adverse events have been reported. Conclusion: Despite temporary changes in retinal function our study reports good tolerability of vardenafil in regard to ocular side effects. Typical ocular side effects seen under treatment with PDE-5 inhibitors are disturbed color vision and temporary effects on the electroretinogram (ERG), which may be due to the fact that PDE-6, typically located in the eye, is also inhibited to a certain degree by PDE-5 inhibitors;9–14 this may depend on the selectivity of PDE-5 inhibition.15 However, these side effects have been exclusively investigated for sildenafil. Therefore, this study was designed to especially investigate the possible influence of vardenafil-induced PDE-5 inhibition on ocular side effects and the function of the retina. The primary objective of the study was to investigate the possible influence of a single oral dose of 40 mg of vardenafil on color vision in normal-eyed male subjects measured by performing Farnsworth–Munsell 100 test at 1, 6 and 24 hours after drug administration. Secondary objectives of the study were further investigations of the eye including effects on retinal function as well as the safety and overall tolerability of vardenafil. To our knowledge this is the first investigation on retinal function following vardenafil administration and the first placebo-controlled study on ocular side effects for the use of vardenafil at all. This was a single-center, randomized, double-blind, placebo-controlled, twofold crossover study with an administration of a single oral dose of a 40 mg BAY 38–9456 (vardenafil hydrochloride) given as 2 tablets of 20 mg in 24 healthy male subjects. The trial was registered at the District Council Cologne, Germany under the registration number BAY 38-9456 / 10197. In detail, demographic features of all subjects are listed in Table 1. Starting from the time of administration, subsequent investigations of the eye were performed according to the study flowchart (Table 2). 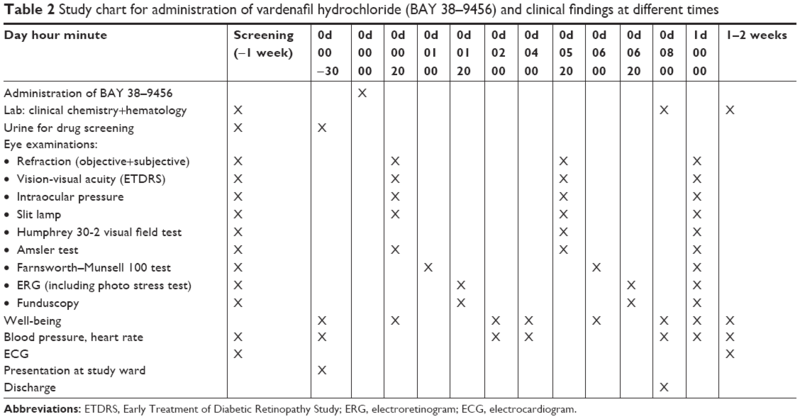 Blood drawings were taken for the determination of the plasma concentrations of BAY 38–7268 (free base of BAY 38–9456 vardenafil hydrochloride) and its major active metabolite BAY 44–5576 for population-pharmacokinetics at baseline (at screening) and at certain time intervals after administration of the test drug. Plasma concentrations were measured by using a validated HPLC/MS/MS-assay with limits of quantification of 0.1 μg/L (BAY 38–7268) and 0.5 μg/L (BAY 44–5576), respectively (Table 3). Abbreviations: ETDRS, Early Treatment of Diabetic Retinopathy Study; ERG, electroretinogram; ECG, electrocardiogram. Monitoring of safety and tolerability of treatment included subjective parameters like well-being and AEs communicated by the subjects and classified by investigators according to their severity and if AEs were non-serious or serious. Objective parameters were monitored by measurement of heart rate, blood pressure and recording of standard electrocardiogram (ECG). Moreover, blood samples were examined in regard to possible alterations of hematological and clinical chemistry parameters. Each of the two treatment periods consisted of one profile day and at 24-hours follow-up examination. Subjects were discharged from the study ward about 1–2 hours after the last examination on days 0 and 1, provided there were no medical objections. There was a wash-out phase of at least one week between each of the two periods. For each subject the study ended with the final examination approximately 1–2 weeks after the second study period. The total duration of the study was four months. 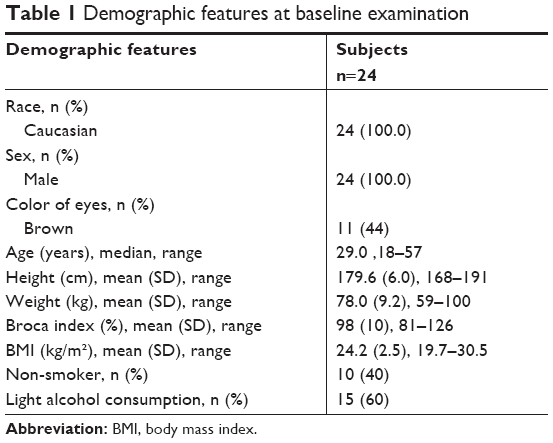 Eye-specific inclusion/exclusion criteria were examined for both eyes. However, only one eye was included for study use. The study was conducted in accordance with the Declaration of Helsinki (1964) in the revised version of 1996 (Somerset West) and 2000 (Edinburgh), the International Council for Harmonisation of Technical Requirements for Pharmaceuticals for Human Use (ICH) GCP Guideline (Note for Guidance on Good Clinical Practice) and the German drug law [Arzneimittelgesetz]. The study protocol was approved by the Ethics Committee of the Medical Faculty, University of Cologne. Subjects must have given their written informed consent to participate in the study after receiving adequate previous information. As test drug vardenafil (free base of BAY 38–9456) was administered orally at dosage of two tablets of 20 mg or corresponding placebo. Medication was given once on day 0 (0d 00) of each study period (Table 2) and in accordance with the randomization list. In order to detect potential ophthalmological changes, BAY 38–9456 (vardenafil hydrochloride) 40 mg was chosen, which was double the expected highest prescribed future dose. A 40 mg dose had previously been found safe in a number of Phase I studies. The amount of dose in the tablet refers to the free base BAY 38–7268 (vardenafil). Scotopic and photopic ERG measurements were performed according to International Society for Clinical Electrophysiology of Vision (ISCEV) standards.17 ERGs were recorded by Amplaid MK15 evoked potential system (Amplaid USA Inc., Rolling Meadows, IL, USA) connected to corneal jet electrodes. Following dark adaptation of 30 minutes ERGs were recorded according to single flash stimulation with constant luminance stimulus (cds/m2) of 2.4 cds/m2 (no background illumination) and 5.0 cds/m2 (additional background illumination of 20 cd/m2). Concentration measurements of BAY 38–7268 and BAY 44–5576 in plasma indicated subject compliance. Moreover, urine probes were taken at baseline to detect possible drug abuse (opiates, amphetamines, barbiturates, cannabis, benzodiazepines, cocaine-metabolites) which would have led to exclusion of the subject. The statistical evaluation was performed using SAS software package (version 6; SAS Institute Inc., Cary, NC, USA). All data were listed and trial summary tables were provided. Exploratory statistical tests were performed to compare the visual function tests following BAY 38–9456 and placebo, respectively. Quantitative target variables were subjected to an analysis of covariance (ANCOVA) with the factors: treatment, period, subject, sequence, time, and the interactions period*time, treatment*time and the baseline value as a covariate. BAY 38–9456 40 mg (vardenafil hydrochloride) was generally well tolerated. Adverse events were more common in subjects receiving active BAY 38–9456 (vardenafil hydrochloride) when compared to those receiving placebo. 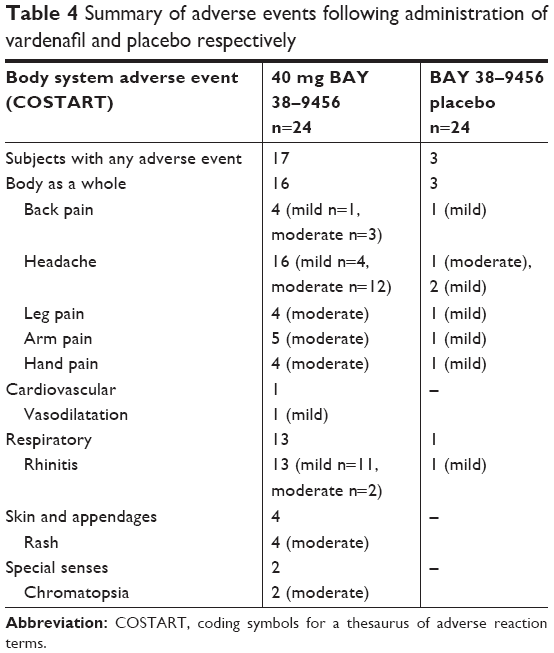 The most frequently reported adverse event in each treatment group was “headache”. The intensity of all adverse events was reported as “mild” or “moderate” and the relationship to study drug was “possible” in all cases. All adverse events had resolved by the end of the study while there was no evidence for a serious adverse event at any time (Table 4). Abbreviation: COSTART, coding symbols for a thesaurus of adverse reaction terms. The color discrimination error score of the Farnsworth–Munsell test was the primary variable for the assessment of the visual function. The most pronounced differences between the two treatment groups were observed for total error score 1 and 6 hours after drug administration, and for error score lines 3, and 4 one hour after drug administration, indicating an impairment of color discrimination particularly in representing color vision of blue/green and purple. Minor differences were still present after 6 hours affecting error score lines 1, 3, and 4. There were no differences after 24 hours between active and placebo (Tables 5 and 6). Abbreviations: ANCOVA, analysis of covariance; LS-mean, least squared mean. In comparison to screening ERG with b-wave amplitude of 225±91 μV (2.4 cds/m2), in ERG after 1 hour 20 minutes with active treatment b-wave amplitude was reduced by 15% compared to a reduction of 10% observed with placebo. 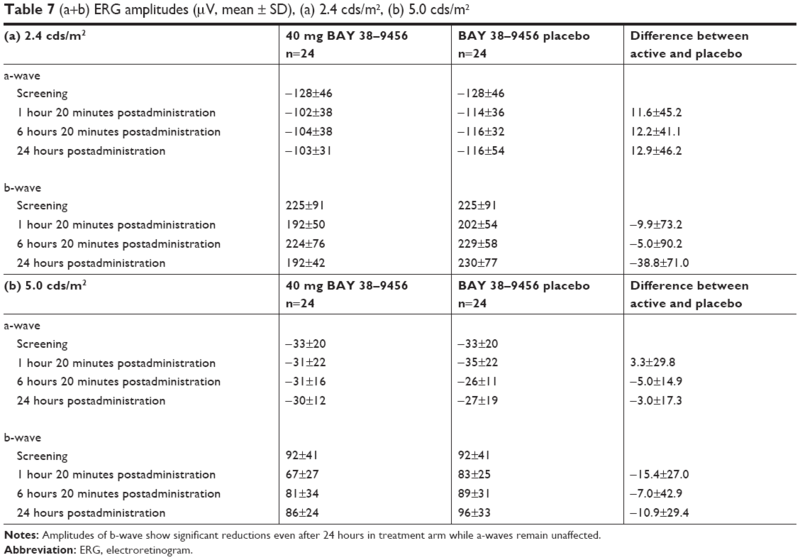 While there was no relevant difference in b-wave amplitude between the treatment groups after 6 hours 20 minutes, there were again differences between active and placebo after 24 hours (Table 7a). Notes: Amplitudes of b-wave show significant reductions even after 24 hours in treatment arm while a-waves remain unaffected. Compared to a baseline value of 92±41 μV (5 cds/m2), b-wave amplitude was reduced by 27% after 1 hour 20 minutes with active treatment while placebo group showed a reduction of 12%. A less prominent amplitude reduction was still present after 6 hours 20 minutes with active treatment. At 24 hours, the amplitude had nearly returned to baseline values; however, there was still a difference between active and placebo after 24 hours (Table 7b). The ANCOVA for the observations of a-wave and b-wave revealed a significant influence of the factor treatment on the amplitude of the a-wave, 2.4 cds/m2 (P=0.0152), as well as on the amplitude of the b-wave, 2.4 cds/m2 (P=0.0302) and 5 cds/m2 (P=0.0028). Moreover, a significant influence of time on the amplitude of the b-wave, 2.4 cds/m2 (P=0.0170) and 5 cds/m2 (P=0.0020), was observed. The b-wave amplitude increased with time after administration of active treatment or placebo. There were no relevant differences between active and placebo in regard to ERG latency for neither a-wave nor b-wave at any time up to 24 hours after drug administration. Other ophthalmological examinations like visual acuity, refraction, intraocular pressure, Humphrey 30-2 visual field test, Amsler grid field test, slit-lamp, and funduscopy did not reveal any significant differences between the two treatment groups (Supplementary materials). Many investigations have been performed on ocular side effects of PDE-5 inhibitors, especially for the use of its best-known representative sildenafil citrate.18–22 In regard to visual function, visual acuity, visual fields, and contrast sensitivity remained unaffected while a temporary impairment of color discrimination represents a definitive effect. Moreover, ERG measurements showed reductions of the b-wave amplitude with no relevant effects on a-wave amplitude which predominantly recovered after 24 hours. There were no relevant differences between active and placebo in regard to ERG latency at any time up to 24 hours following drug administration. Studies on retinal function after sildenafil administration show a complete recovery of all ERG parameters within 24 hours.9,13 However, as we found a mild reduction of the b-wave amplitude even 24 hours after ingestion of vardenafil our study design could not deliver data on detecting a more precise point in time for complete recovery. In conclusion, BAY 38–9456 40 mg (vardenafil hydrochloride) was generally well tolerated. As expected, adverse events were more common in subjects receiving active BAY 38–9456 (vardenafil hydrochloride) compared to those receiving placebo. Our study shows comparable results to studies on sildenafil and confirms a good tolerability of vardenafil in regard to ocular side effects. Moreland RB, Goldstein I, Traish A. Sildenafil, a novel inhibitor of phosphodiesterase type 5 in human corpus cavernosum smooth muscle cells. Life Sci. 1998;62(20):PL309–PL318. Boolell M, Allen MJ, Ballard SA, et al. Sildenafil: an orally active type 5 cyclic GMP-specific phosphodiesterase inhibitor for the treatment of penile erectile dysfunction. Int J Impot Res. 1996;8(2):47–52. Ballard SA, Gingell CJ, Tang K, Turner LA, Price ME, Naylor AM. Effects of sildenafil on the relaxation of human corpus cavernosum tissue in vitro and on the activities of cyclic nucleotide phosphodiesterase isozymes. J Urol. 1998;159(6):2164–2171. Porst H, Rosen R, Padma-Nathan H, et al. The efficacy and tolerability of vardenafil, a new, oral, selective phosphodiesterase type 5 inhibitor, in patients with erectile dysfunction: the first at-home clinical trial. Int J Impot Res. 2001;13(4):192–199. Stark S, Sachse R, Liedl T, et al. Vardenafil increases penile rigidity and tumescence in men with erectile dysfunction after a single oral dose. Eur Urol. 2001;40(2):181–190. Klotz T, Sachse R, Heidrich A, et al. Vardenafil increases penile rigidity and tumescence in erectile dysfunction patients: a RigiScan and pharmacokinetic study. World J Urol. 2001;19(1):32–39. Hellstrom WJ, Gittelman M, Karlin G, et al. Vardenafil for treatment of men with erectile dysfunction: efficacy and safety in a randomized, double-blind, placebo-controlled trial. J Androl. 2002;23(6):763–771. Keating GM, Scott LJ. Vardenafil: a review of its use in erectile dysfunction. Drugs. 2003;63(23):2673–2703. Vobig MA, Klotz T, Staak M, Bartz-Schmidt KU, Engelmann U, Walter P. Retinal side-effects of sildenafil. Lancet. 1999;353(9150):375. Zrenner E. No cause for alarm over retinal side-effects of sildenafil. Lancet. 1999;353(9150):340–341. Luu JK, Chappelow AV, Mcculley TJ, Marmor MF. Acute effects of sildenafil on the electroretinogram and multifocal electroretinogram. Am J Ophthalmol. 2001;132(3):388–394. Gabrieli CB, Regine F, Vingolo EM, Rispoli E, Fabbri A, Isidori A. Subjective visual halos after sildenafil (Viagra) administration: Electroretinographic evaluation. Ophthalmology. 2001;108(5):877–881. Laties A, Zrenner E, Viagra ZE. Viagra (sildenafil citrate) and ophthalmology. Prog Retin Eye Res. 2002;21(5):485–506. Jägle H, Jägle C, Sérey L, et al. Visual short-term effects of Viagra: double-blind study in healthy young subjects. Am J Ophthalmol. 2004;137(5):842–849. Beavo JA. Cyclic nucleotide phosphodiesterases: functional implications of multiple isoforms. Physiol Rev. 1995;75(4):725–748. Kinnear PR. Proposals for scoring and assessing the 100-hue test. Vision Res. 1970;10(5):423–433. Brigell M, Bach M, Barber C, Kawasaki K, Kooijman A. Guidelines for calibration of stimulus and recording parameters used in clinical electrophysiology of vision. Calibration Standard Committee of the International Society for Clinical Electrophysiology of Vision (ISCEV). Doc Ophthalmol. 1998;95(1):1–14. Laties AM, Fraunfelder FT. Ocular safety of Viagra, (sildenafil citrate). Trans Am Ophthalmol Soc. 1999;97:115–125. Yajima T, Yajima Y, Koppiker N, Grunwald JE, Laties AM. No clinically important effects on intraocular pressure after short-term administration of sildenafil citrate (Viagra). Am J Ophthalmol. 2000;129(5):675–676. Sponsel WE, Paris G, Sandoval SS, et al. Sildenafil and ocular perfusion. N Engl J Med. 2000;342(22):1680. Birch DG, Toler SM, Swanson WH, Fish GE, Laties AM. A double-blind placebo-controlled evaluation of the acute effects of sildenafil citrate (Viagra) on visual function in subjects with early-stage age-related macular degeneration. Am J Ophthalmol. 2002;133(5):665–672. Grunwald JE, Metelitsina T, Grunwald L. Effect of sildenafil citrate (Viagra) on retinal blood vessel diameter. Am J Ophthalmol. 2002;133(6):809–812. Grunwald JE, Jacob SS, Siu K, Piltz J, Dupont J. Acute effects of sldenafil ctrate (Viagra) on intraocular pressure in open-angle glaucoma. Am J Ophthalmol. 2001;132(6):872–874. Nivison-Smith L, Zhu Y, Whatham A, et al. Sildenafil alters retinal function in mouse carriers of retinitis pigmentosa. Exp Eye Res. 2014;128:43–56. Behn D, Potter MJ. Sildenafil-mediated reduction in retinal function in heterozygous mice lacking the gamma-subunit of phosphodiesterase. Invest Ophthalmol Vis Sci. 2001;42(2):523–527.